Studies have shown that people learn best while laughing. I believe in beinging Biblical lessons into the lives of families through a joyous event with lots of visuals and even more laughter! 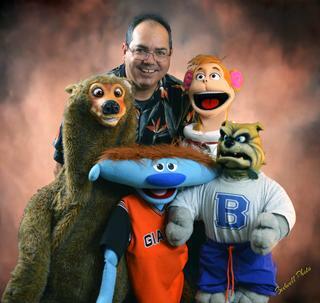 You've seen Tony perform at Children's Pastors' Conferences and One Way St. conferences, where he teaches advanced puppetry, ventriloquism, and gospel magic tricks. He has performed over 5,000 live shows! For pictures of Tony Borders' many Puppet Apostles and for more information please utilize the contact information listed below. Visit www.tonyborders.com for several references. Tony was a 5th grade school teacher and knows how to reach the upper elementary with humor and lessons as well as the younger kids with visuals. His constant variety is appreciated by all ages, switching from puppetry to ventriloquism to tricks to volunteer stories. During the school year he will help you try to arrange a local school assembly so your church children can invite their friends more easily.